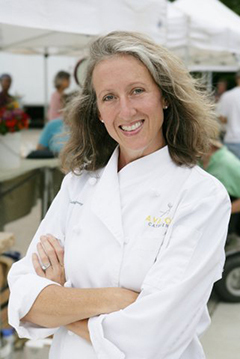 For the last 15 years, Cathy Conway has been steering Avalon Catering in the direction of local, sustainable foods. Precipitated by an experience in France at a small roadside stand, she realized that the only way to truly understand real food is to procure it from its source. Since then she has made it her work to meet and understand local farmers, support them by purchasing ingredients for her business and her home, and invest in the future of these farms and sustainable agriculture in Georgia by supporting groups such as Georgia Organics and The Georgia Department of Agriculture. Building strong relationships has allowed her to establish a network of local, organic, artisan purveyors who produce goods that reflect a stewardship to the earth that is unsurpassed. Cathy's passion, coupled with 23+ years of catering and event design in Atlanta, create a unique opportunity for her customers. No where else in Atlanta can you find a caterer with such a diverse portfolio of resource and experience with an eye to special events and sustainability.